Welcome to the last day (Day #7) of Raw Chocolate Theme Week and the first day of Chocolate and Peru Theme Week. 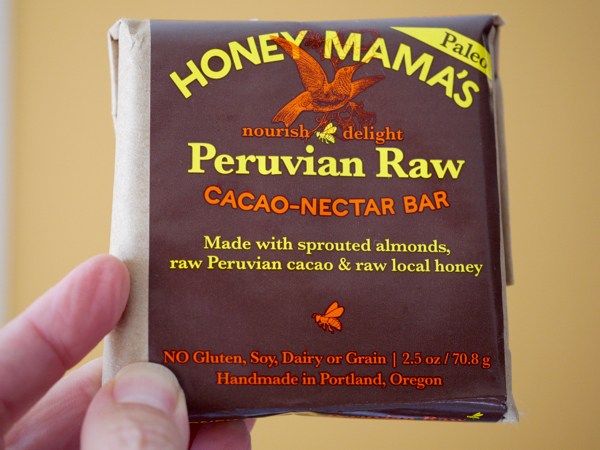 Today's Peruvian Raw Cacao-Nectar Bar was from Honey Mama's (Portland, OR). 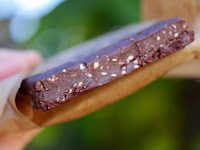 "Made with sprouted (Organic) almonds, raw Peruvian cacao and raw local honey," the raw cacao provided "an extra dose of anti-oxidants," (due to lack of processing). Rather than added cocoa butter, Honey Mama's bars contained unrefined Organic coconut oil -- which also meant a lower melting temperature than conventional tempered dark chocolate bars. These bars should be kept refrigerated until ready to eat. This honey-sweetened, Peruvian Cacao-Nectar bar had a coconut cookie aroma, and an even, smooth dark chocolatey melt—a healthy cookie-chocolate bar hybrid. The well-crafted, rustic bar had a satisfying, almost crunchy, coconut (and almond bit) texture—with an occasional sparkle of salt—and a chocolate coconut cookie finish. The handmade in Portland, paleo bar was labeled as containing "no gluten, soy, dairy or grain." *Retention of nutritive properties and a desire for less-processed food, are generally reasons behind the preference for raw chocolate.